Stronghold Coatings presents new literature describing their Dichtol line of polymeric capillary action sealers that seal porosity, micropores and hairline cracks without vacuum or pressure. This two-page, full-colour brochure profiles the entire family of products which are ideal for castings, electronics, composites and other critical components and structures. Easily applied by immersion, injection, brushing, or pump spray. Products featured include Dichtol 1532, a U.S. Military approved product (NSN: 8010016541508) to seal micropores and hairline cracks to 0.0039 of an inch, Dichtol 1525 a modified-water soluble sealer which is suitable for confined space (U.S. Military approved – N11N assigned), Dichtol 1546 ideal for open structures, it dries in minutes and seals pores to 0.20” (0.1 to 0.5 mm), WF49 a solvent based system for optimal corrosion and solvent resistance, and more. 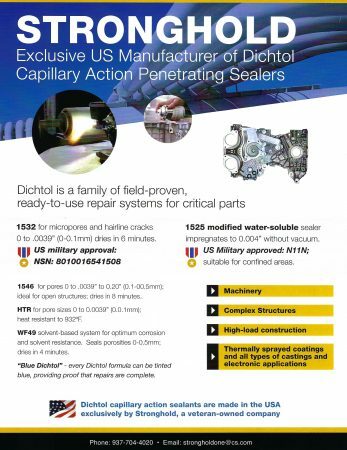 All Dichtol formulas can be tinted blue, providing 100 per cent visual verification that repairs are completed.